Do you know what I love about sales? 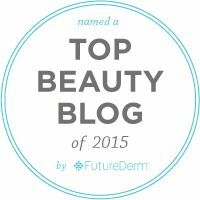 I get to indulge my love for really luxurious makeup and save a little money in the process. 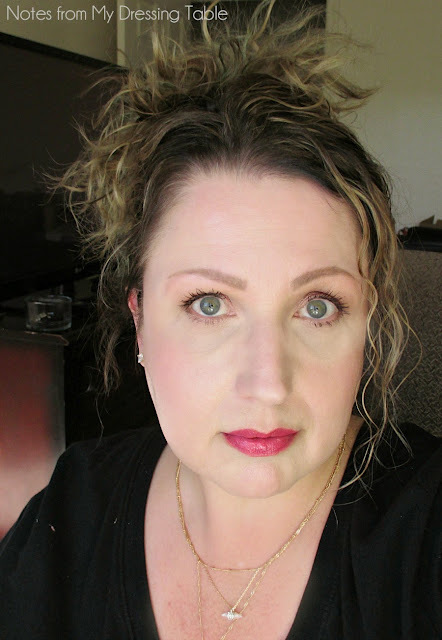 I recently treated myself to a few goodies during the Sephora VIB sale and one of the items I splashed out on is the Giorgio Armani Rouge Ecstasy Express Moisture Rich Lip Colour. I chose No. 501 Peony; a beautiful, vibrant pink that I felt would carry me nicely through the Spring and Summer. I know that my shade selection isn't super exciting. Shocking... Erika bought another pink lippie. I just knew that I would get the most use out of a shade like this and I'm not blowing this kind of moolah on mere dressing table art. If I am going to spend this much for a lipstick, I'm going to get every penny's worth of enjoyment out of my investment! Every detail of design is perfectly attended to. Reminiscent of bamboo, the packaging on this lipstick is pure sculpture. The red lacquered tapered, twisted oval metal outer casing is ornamented at the point of separation with a tiny medallion embossed with the Giorgio Armani logo. The cap is magnetized to pull it into perfect alignment and keep it securely closed to prevent accidental opening and smearing of the inside of your handbag. When you twist up the bullet you find the Armani logo embossed in the lipstick. 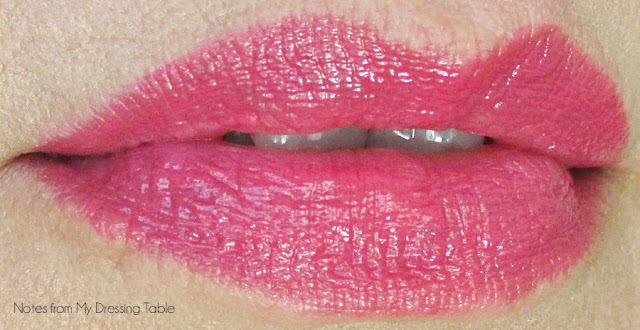 A long-wearing, velvety-soft lipstick that leaves lips hydrated and saturated with color. The Giorgio Armani laboratories continue to push boundaries with this innovative hybrid lip color featuring a moisturizing layer to protect and repair the lips. It's infused with a kaleidoscope of pearls and colored oils deposited over dyed colors—leaving lips feeling soothed and looking vibrant. Rouge Ecstasy Excess Moisture Rich Lip Color achieves the comfort and softness of a lip balm while leaving lips repaired and color saturated. 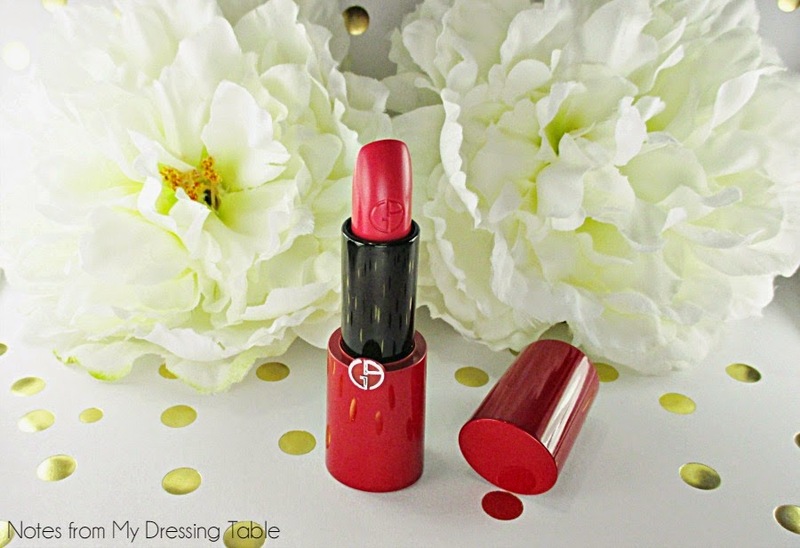 Coat lips with this everyday lipstick that imparts ultra-luminous, lasting color. All of the Rouge Ecstasy Excess Moisture Rich Lip Color shades are inspired from a particular memory for Mr. Armani. Bis-Diglyceryl Polyacyladipate-2, Pentaerythrityl Tetraisostearate, Pentaerythrityl, Isostearate/Caprate/Caprylate/Adipate, Caprylic/Capric Triglyceride, Cera Microcristallina/ Microcrystalline Wax, Octyldodecyl Neopentanoate, Polybutene, Arachidyl Propionate, Butyrospermum Parkii Butter/Shea Butter, Hydrogenated Coco-Glycerides, Hydrogenated Jojoba Oil, Vinyl Dimethicone/Methicone Silsesquioxane Crosspolymer, Hdi/Trimethylol Hexyllactone Crosspolymer, Copernicia Cerifera Cera/Carnauba Wax, Disteardimonium Hectorite, Ascorbic Acid, Hydroxycitronellal, Hydroxypropyl Tetrahydropyrantriol, Hydrolyzed Linseed Extract, Magnesium Silicate, Calcium Aluminum Borosilicate, Silica, Calcium Sodium Borosilicate, Synthetic Fluorphlogopite, Benzyl Alcohol, Tin Oxide, Cinnamyl Alcohol, Linalool, Isoeugenol, Alpha-Isomethyl Ionone,BHT, Alumina, Fragrance, [+/- May Contain Ci 77891/Titanium Dioxide, Ci 77491, Ci 77492, Ci 77499/Iron Oxides, Ci 45410/Red 28 Lake, Ci 15850/Red 7, Ci 45380/Red 22 Lake, Ci 15985/Yellow 6 Lake, Ci 42090/Blue 1 Lake, Ci 15850/Red 6, Ci 19140/Yellow 5 Lake, Ci 15850/Red 7 Lake, Ci 75470/Carmine, Mica]. No. 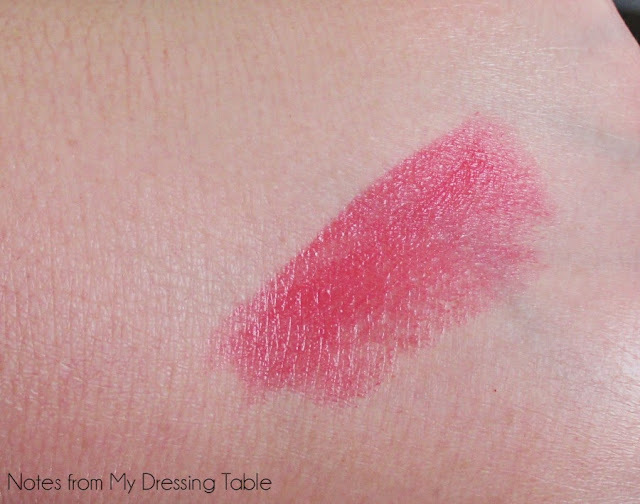 501, Peony is a bright, beautifully balanced pink that I feel would be flattering to a wide range of skin tones. The smooth gel/creme is very nicely pigmented and has excellent colour payoff on the lips for such a lightweight, silky formula. Application of this lipstick is pure pleasure. It glides on effortlessly with no pull or drag, settles into place and wraps my lips in beautiful colour, a gentle, glossy shine and leaves them feeling soft and cherished, all day long. The light, slippy, moisturizing formula doesn't provide long wear. I have to touch up often but I don't mind. It only takes seconds and the colour and comfort make it worth the little extra effort. This shade is so me. I really do like it and it is fun to have a little piece of luxury to carry with me and enjoy. Do you own any shades of this beautifully formulated lip colour? Which are your favorites? 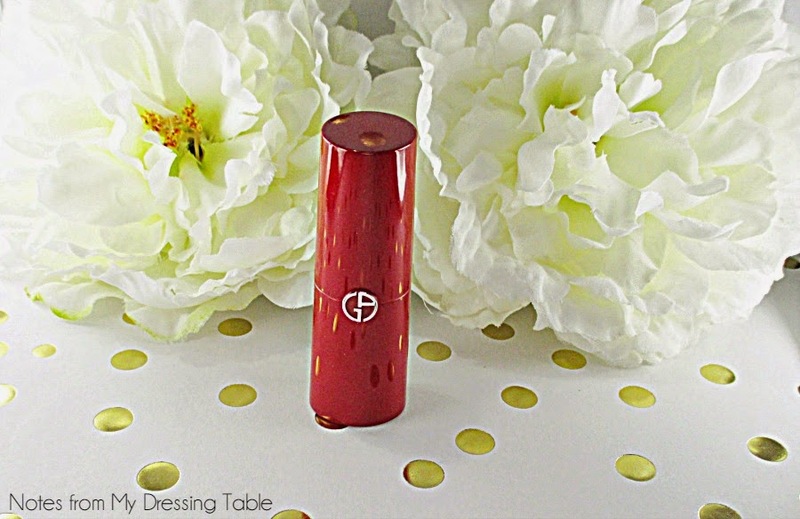 Giorgio Armani Rouge Ecstasy Express Moisture Rich Lip Colour, $35.00 is available at Sephora, Nordstrom, Neiman Marcus, Saks Fifth Avenue and other fine retailers that carry Armani Beauty. Love that shade of pink! Perfect! I haven't tried any Armani lipstick and now you've got me adding something else to my wish list! I don't know which is better the packaging or the lip color. Both are fabulous. Another pink lippie - but pink lippies look great on you, especially this one!! Great review. I love splurging on a lipstick!! That's a gorgeous shade on you. I love this photo since you look refreshed and lively. Girl, that is not just another pink. That is an awesome pink. Probably the best I've seen on you. Isn't it nice to take out a nice, substantial lippie tube and enjoy that velvety goodness? I don't own any of this brand, but it looks like a winner! I haven't tried this range, but I do have the Rouge d'Armani lippies and ADORE them (dooooo try). This is what I call your PERFECT lippie shade! Yes! It's beautiful and so lovely to wear. Thank you so much! I need to try the Rouge d'Armani. I just love the formula on this one. So comfortable. Thank you. :) Yeah... I already want more shades of this formula. I love wearing it. I love having a luxe lippie at hand. There is nothing like it. :D Thank you for your sweet words. Thank you. I think so... I love this pink! Thank you. I just like them soooo much. Lippie splurges are good because they aren't huge but you get so much out of them. It's a toss up! The colour and formula are fabulous and the packaging... It's so luxe! Thank you! You need to get you one of these! It's so chic! That color looks like it was made for you! Thank you so much! I love this one. 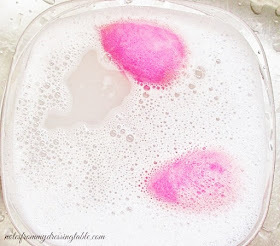 Ooh... such a pretty splurge :) I love the color on you - it's like a watermelon... so pretty! Thank you. I'm in love with this lipstick. Thank you! It is kind of watermelon. It's certainly that juicy. Wow, that color is gorgeous and looks great on you!